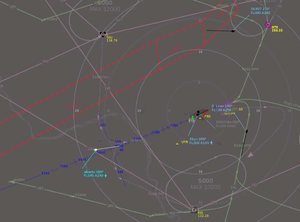 EDDF with procedures, routes and additional information. You can define standard routes to OpenRadar. This can be done by converting a NavaidDB file and improve the result or define it from scratch by adding lines, curves and bows to the radar screen. So you can define waiting loops, STARs and SIDs if you want to and if you need them. Please send your finished work in to include it into the next OpenRadar update for everybody. To have an example, check out airport LFSB. It is our showcase in this matter. Please be warned: Defining all approaches and procedures for a more complex airport may produce too much details to work with. Concentrate on the important things, like additional vectors or waiting rooms. To avoid that everyone develops his own standards, we need to agree to common standards. always These routes are always displayed. You cannot switch them off using the STAR/SID switch. That means that you can use them to enrich the map itself: For forbidden areas or areas that require a minimum height... or for instance to add the names for taxiways to the map. optional This route will be hidden when you switch off START/SID. You can use it for any route specific elements, that are not related to a specific runway. sid / star These values mark a route as sid/star. In future we might want to select a sid/star from a list. To be able to do that, we need to know which routes we need to display. WARNING: Known issues: There is an major issue when reading the procedure file, in the current version. I will fix it soon, but it requires to implement more functionality to define standard routes... I will need some time to do that. Until this feature works, it is disabled in the published versions of OR. There is already an XML format that contains the STARs and SIDs. Converting it can save you some work. The SID/STAR xml files can be bought and downloaded for a few bucks from Navigraph. Generally FlightGear looks for them in a Airports/I/C/A/ICAO.procedures.xml (where ICAO is an airport). For example, the procedures file for ELLX, if it exists, is under Airports/E/L/L/ELLX.procedures.xml. Now when restarting OpenRadar, the converted routes are available. You can and should modify the new file following the explanations below. The files must be located in directory data/routes/[airport name]. activeStartRunways Yes A comma separated list of runways. If one of them is active for starts the route will be displayed. navaids Yes A comma separated list of navaid ids (FIX, NDB, VOR, Airportcodes) that will be highlighted if this route is being displayed, regardless if the main switches for FIX/NDB etc. are enabled or not. This tag can have an attribute color that defines the color for the navaids in RGB values. Example: color="120,140,120" There can be multiple instances of this element having different colors assigned. Use the Attributes zoomMin and zoomMax to define a range in which a route is being displayed. So you can separate routes interesting for APP zoom level from details on tower level. If navaids block has no color defined, the route's color is being used. If route's block has no color defined, a default color will be used. Then follows the color attribute of the current navaids block, if defined. Then follows the color attribute of the current route block, if defined, its default color otherwise. Navaids used in many routes are of somewhat importance and should get their own static route and a separate color as hotspots. In conflict case, the color, that is found first, wins. All elements of your route base on points and angles. Angles are magnetic and defined in degrees. Navaid You can use the navaid ID, e.g begin="BLM"
Runway end You can use any runway end of the current airport. e.g. Runway 15 at Basel: begin="LFSB-RW15"
Geographic Location You can use the geographic location separated by a comma. e.g. Relative Location You can define a point relative to a navaid in the format: dddNMaaa@iii (where ddd is the decimal distance in NM, aaa is the magnetic bearing from iii, which is a navaid id. Distance and heading have the decimal separator 'dot'. Length' are also given in decimal NM. point Yes The geographic coordinates of the point. It is possible to share xml route definitions between airports to avoid duplicating them. This is done quite straight forward, but including a file with relative path to the current file. The included file needs to have the same structure as the main file and will be imported after all files in the current directory are imported. Note This xml element is on the same level as the routes. A line is a line is a line. It can be defined (1) either via two points or (2) via one point, direction and length. lineWidth Yes The width of the lines to be painted. Default is 2px. Use 1px for vectoring helper lines (dashed/dotted)... Deprecated, define it in stroke! arrows Yes Paints arrows at the lines end, pointing in direction from start to end: Possible is "begin", "end", "both". Optionally you can define the arrow size by appending a comma and the size of the arrow. Default is 10, big would be 20. Example: "end,20"
color Yes Defines the color of this line. Overwrites the definition in <route>. Define it there if possible. text Yes Whatever you define, will be displayed in the middle of the line. The line is broken at this spot. arrows Yes Paints arrows at the lines end, pointing in direction from start to end: Possible is "begin","end",both", Optionally you can define the arrow size by appending a comma and the size of the arrow. Default is 10, big would be 20. Example: "end,20"
text Yes Whatever you define, will be displayed at the middle of the line. The line is broken at this spot. This element can be used to draw polygons, both open and closed. In difference to the other XML elements, this element contains children named points. Their content is a normal point definition as explained above. radius No The radius in NM that the plane has to fly. You can also use speed to define it. (radial) No Alternative to endHeading: The radial you want to intercept. The radial is the direction from the endPoint, so it is the opposite of endHeading. text Yes Whatever you define, will be displayed in the middle of the second line. The line is broken at this spot. Known-start-of-turn Case In this case there is no first line. The drawing starts directly with the bow. Undesired results Constructing an intercept is easy with ruler and triangle, but more difficult when you are facing numerics and different coordinate systems. I have performed a lot of tests and are pretty sure that it works now, but there still can be issues. Parallel headings cause the problem, that I have to ignore the radius definition to connect them with one bow. I use the distance between the lines as bow diameter. Long lines In the general case most problems I saw arose from a radius, that was too small. If the lines are getting closer with growing distance from start, a small radius will cause the lines to be too long. In that case consider to use a larger radius or split the intercept into two. Bow behind startPoint: This is often caused by the fact that the plane needs to fly a wider radius to intercept the endHeading. In that case consider to use a larger radius or split the intercept into two. Other cases If construction is not possible, the result freaks out and paints something else. Verify your parameters! I help if I can, as this also might be a bug. Please send in your route! Currently it is not possible to draw S-shape like intercepts automatically. I plan to add it, but need time and a free head for that. Use two intercepts until then! Curves are an easy and comfortable way to connect lines if there is not radius defined and if the angle is small. A curve is implemented as quad curve, so it has a startPoint, an endPoint and an controlPoint which controls the curving. A good start point for the control point is the interception between the lines that should be connected. controlPoint No The location of the control point of this curve. A bow is a part of a circle around a specified point. It can be used to define circling approaches or wider curves. text Yes Whatever you define, will be displayed at the center angle of the bow. The line is broken at this spot. navpoint No The hook of the parking. The target of the inbound direction, where the pilots turn into the loop. inboundHeading No As magnetic direction. misapHeight Yes The default height for missed approaches. This element draws a text at the specified spot. If marked as clickable, it can be used to assign a route to the selected contact with a single click. alignHeading Yes Alternative to angle. The text will be displayed aligned to a heading. Useful if you want to write along a route leg. color Yes Defines the color of this text. Overwrites the definition in <route>. Define it there if possible. clickable Yes If set to "true", the route can be assigned to the selected contact with a single click onto this text. text No This text will be displayed. Single line only! This element draws a text at the specified spot on your radar display. It will not pan, nor zoom with the rest of the map. screenPos No The position of the text's center in pixels in x,y format, e.g. "50,50". x,y start in the upper left corner. Negative values count from the other side of the screen. "center" works on per x/y base too. This element draws the known minimum altitude symbol. This element draws speed and/or altitude restrictions. position No The position of the centre if the restriction element. maxspeed Yes The maximum permitted speed in knots. notabove Yes The altitude above which aircraft should not proceed, see below for how this can be represented. notbelow Yes The altitude below which aircraft should not proceed, see below for how this can be represented. color Yes Defines the colour of lines and text in this element. Overrides the colour inherited from the <route>. The type of restriction displayed is controlled by the combination and relationship between the three options maxspeed, notabove and notbelow . Not all the combinations are useful; specify none of the three and you'll get a blank restriction you can't even see. Specify all 3 options and where notabove and notbelow are not equal you'll get this helpful error message displayed. The remaining 9 combinations are useful. It is obviously incorrect to assume that GND will be 0, but it is sufficient in most cases in order to determine which of the 2 levels would be greater than the other, there are cases where this could be a problem (where the ground is below sea level perhaps), in the unlikely event that you encounter one of these rare situations, please use the actual altitude in feet as a workaround. This element can be used to include all elements of another, already defined, route into the current route. You shall use it, to avoid duplicate route definitions for the part, that is shared by multiple routes. Note The include tag does not inherit route definitions like route attributes, active runways or navaids to highlight. These definitions must be done for each real route (the one that includes the shared route). Only the route elements like lines, intercepts etc. are included. routeName No The name of the route that will be included. This page was last modified on 26 January 2016, at 06:32.